A delegation of leading Republican members of Congress are urging newly installed Secretary of State Mike Pompeo to cut all U.S. taxpayer funding to the Palestinian government over its continued use of American dollars to pay the salaries of terrorists and their families, according to communications between these lawmakers and the State Department. A group of 14 lawmakers formally petitioned Pompeo this week to "immediately suspend all aid payments to the Palestinian Authority" due to recent reports these funds continue to be used to pay convicted terrorists and their families, a material breach of newly passed laws barring American aid money being used for such purposes. The lawmakers seek a public showdown with the Trump administration over the future of U.S. aid to the Palestinian government, which has publicly refused to comply with new U.S. laws mandating the terror payment program known as "pay to slay" be stopped. While similar efforts to cut U.S. aid to the Palestinian government for its open support for terrorism have not gained traction under past administrations, the latest call is expected to gain steam as President Donald Trump executes a more hardline stance on Palestinian terrorists and their regional supporters, including Iran. 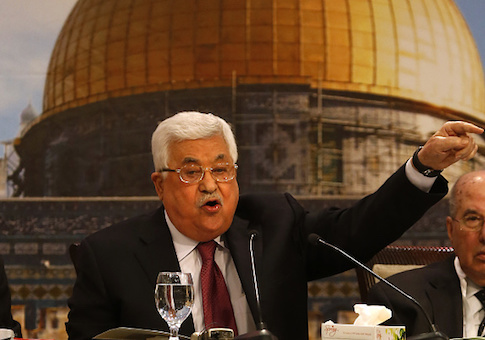 The letter, the existence of which was first disclosed by the Washington Free Beacon, follows another recent report in this publication disclosing that the Palestinian Authority continues to spend U.S. aid dollars on terrorists. Palestinian officials have also made clear that they have no intention of following the new law and will continue to provide terrorists and their families with compensation. While these payments have been a source of congressional concern for some time, the recent passage of the Taylor Force Act—a bill meant to end these payments—has provided the legal grist necessary for congressional opponents of U.S. aid to the Palestinian government to see this aid cut. The Trump administration is mandated under the law to report to Congress on how U.S. aid dollars are benefiting Palestinian terrorists, but has yet to formally do so, sparking further irritation on Capitol Hill. "Earlier this year, Congress took a bipartisan and resolute stance: we will not continue providing American aid to the Palestinian Authority if they use that money to pay terrorists and their families. These evil individuals seek to harm the United States and our ally Israel," Rep. David B. McKinley (R., W.Va.), the original author of the letter, told the Free Beacon. "Since the Palestinian Authority has continued making these payments, we're calling on Secretary Pompeo to suspend all aid until the situation can be resolved." In addition to McKinley, the letter garnered the support of Reps. John Ratcliffe (R., Texas), Louie Gohmert (R., Texas), Steve King (R., N.Y.), and several others. "We urge you to immediately suspend all aid payments to the Palestinian Authority," the lawmakers write in the letter. "Further, we urge you to make the cessation of this abhorrent practice that incentivizes terrorism a pre-condition for any U.S.-brokered peace talks between the sovereign state of Israel and the Palestinian Authority." The lawmakers also are demanding the State Department disclose for the first time the total amount of U.S. taxpayer dollars that have been used by the Palestinian government to support terrorists and their families. The total could be in the millions. The lawmakers instruct the State Department to outline in detail: "How many foreign aid dollars went to the PA that were then used to fund terrorists prior to passage of the Taylor Force Act?" They are additionally requesting information on what measures the administration is "planning to take to enforce the law and suspend aid to the PA, given the above statements and the content of their proposed budget?" according to the letter.